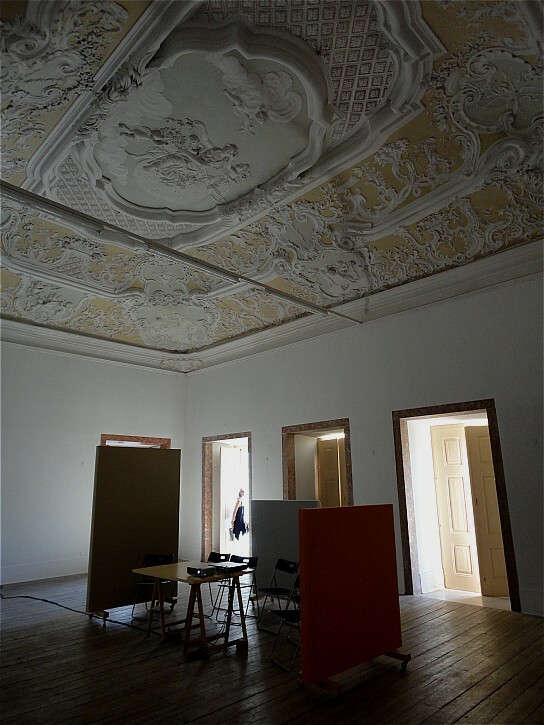 This is the only totally restored room in the decayed 17th century Pombal Palace in Lisbon. It's been used for video installations. Love to see the restoration and it is lovely as is your capture! Marvelous detail! Enjoy your weekend, JM! I hope they can acquire the funds to restore the rest of the palace. As restaurações são muito importantes. Acho que o espaço está sendo sub-aproveitado. Seria necessário que fosse realizada as demais restaurações. Tão belo... e o valor histórico? Nem se fala. Looks like they've done a good job. Realmente é uma pena o estado de muito do nosso património. Look at that ceiling! Wow! Let's hope the entire place will be restored! The craftsmanship in olden days was incredible! Just lovely. Look at those floors! I am so pleased it has been saved. The craftmanship that went into the original must be saved for future generations to appreciate. The ceiling and the walls look like they come from entirely different rooms. The ceiling is remarkably ornate and beautiful. The walls are entirely flat and unadorned. Odd. I wonder if they are planning to do the rest? Maybe you have said already -- I am behind on reading blogs as we don't always have time when we're on a roadtrip as now. anyway this room is beautifully done. The light is very beautiful, just hinting at what activity may come. What an interesting place for a meeting ! That's is a lovely ceiling. Here's hoping that other rooms will be restored too.